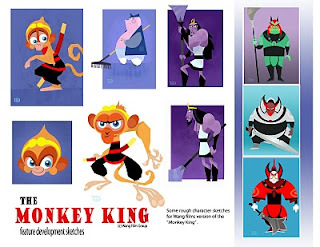 My pal Mark Oftedal and I were asked a while back to do some inspirational character sketches for Wang Films animated feature based on the classic story "Journey to the West" ... or "The Monkey King". 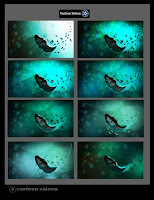 Above are a few of my developmental color sketches for the film. 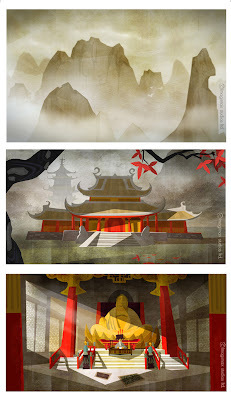 Below: A video of stills from the final film created by Wang Film productions in Taiwan. Mark and I weren't on the production, and had nothing to do with the final outcome. But I think it's interesting to see what the studio did (or didn't do) with our designs. I think the song on the video is from the end title credits of the film. 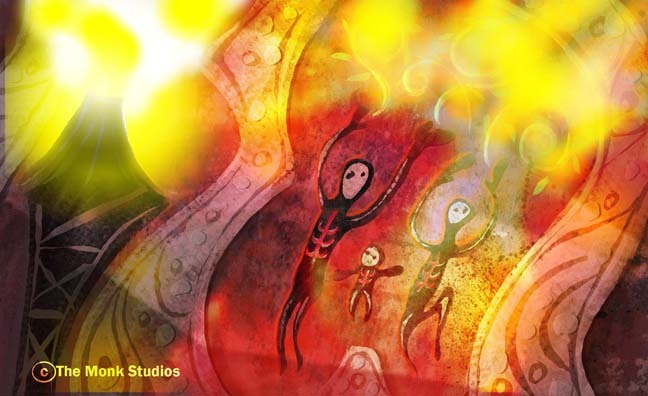 Above and below: I was asked by the nice people at the Monk studios to help develop an in-house project called "Lava Boy"... a story conceived by P'Parn and some of the animators on staff there. 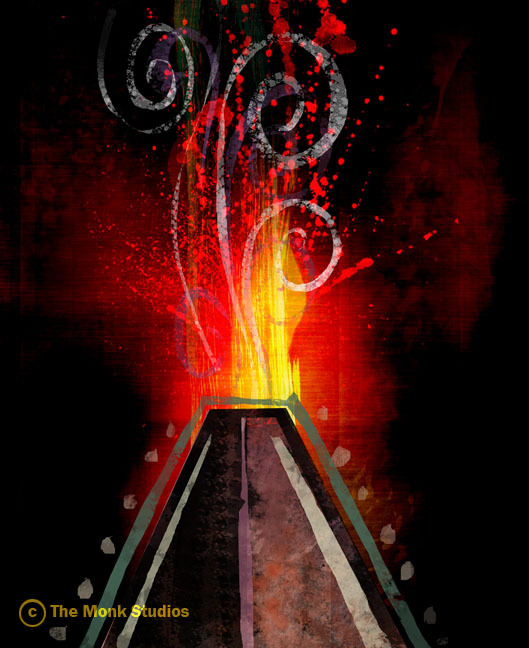 I was interested in developing the idea that the legend of "Lava Boy" was as old as time... and had been passed down from generation to generation. 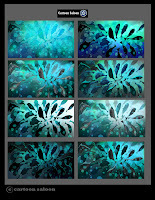 I love the power of Oceanic art, and drew inspiration from it in my early concept sketches. I also was inspired from a working trip to Reunion Island. Reunion is incredibly beautiful, and has one of the most active volcanoes in the world. I could easily visualize the story taking place in a fragile environment such as this. "Lava Boy" is still being developed as the studio has time. I hope my sketches will help inspire the artists in some way. One of the most influential people in my career was my friend and mentor, Maurice Noble. He selected a small group of us right out of art school to train, and help him design projects at several studios in the Los Angeles area. This small group became known as the "Noble Boys". 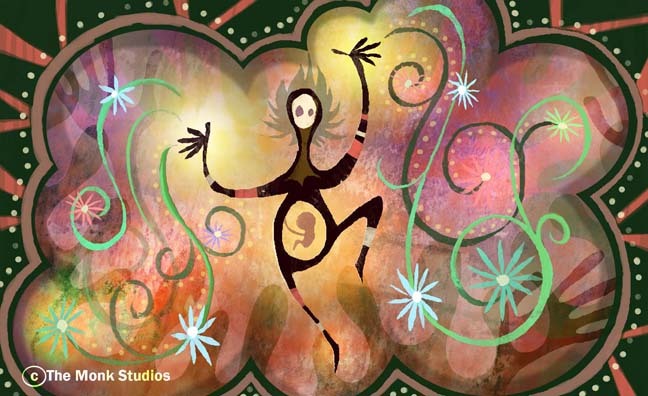 One of Maurice's assignments was to develop and design folk stories from around the world using ethnic art as inspiration. We had all grown up watching Looney Tunes, and Disney. Maurice wanted to push us out of our comfort zone... looking to folk art, instead of simply regurgitating old cartoon design styles. 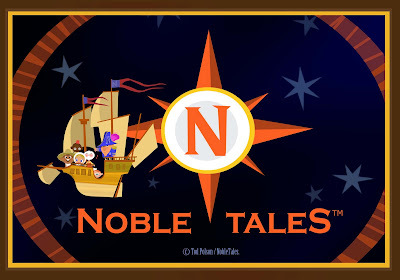 The group of stories we developed eventually became known as the "Noble Tales". 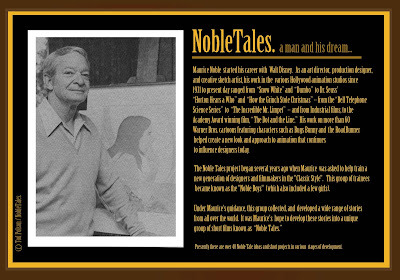 Maurice thought the ideas we came up with were so good, that at the ripe young age of 86 decided to start a company, and market "Nobletales" as a TV series. 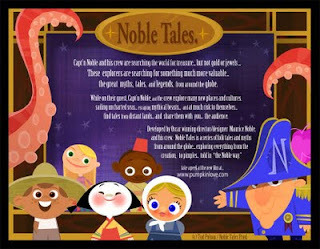 Above: One of the incarnations of "Noble Tales" I designed... with a Captain Noble, and his crew as "host". 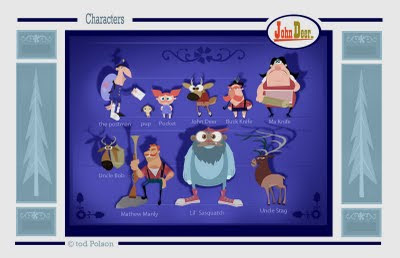 We pitched "Nobletales" all over town... and while many studios liked the concept... they felt it would be difficult to market a group of shorts as a series. They needed reoccurring characters to tie everything together... and of course, sell toys. So we developed a number of main character concepts... from Aliens, to an old explorer in a flying ship. 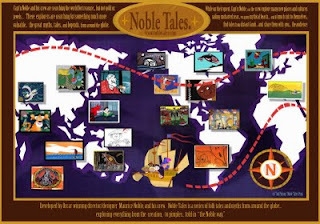 Above: A few of the "NobleTales" stories developed by Maurice and the gang. We have yet to launch NobleTales as a series... I keep making shorts as I have time and money... mostly because I just like making short films. "Al Tudi Tuhak", "The Pumpkin of Nyefar", "Escape of the Gingerbread Man!!! 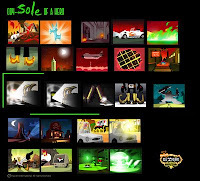 ", and at the time of this post, have just completed a rough animatic of "To Be a Cow", narrated by veteran actor Soon-Tek Oh. Note: The Nobletales website is currently not working. I am hoping to relaunch the site soon. 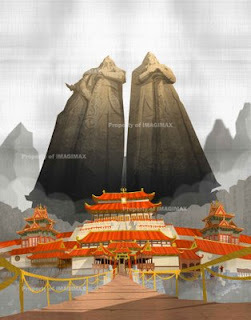 The "River of Kings IV" concept revolved around the legendary Himaphan forest, and a brave warriors quest to find the one true king. 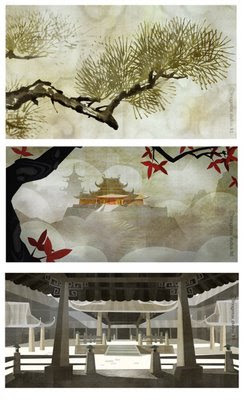 Above: Stills from the final TVC. I was asked to design, and direct the advertising campaign for the show... appealing to an international audience. 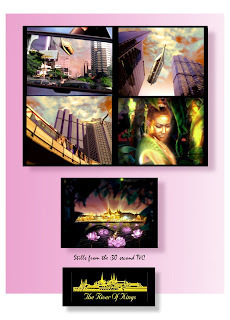 I thought it would be nice to show that old Thai myths, and legends were still very much alive in modern Bangkok. Having creatures from the Himaphan forest roam around the city. For a number of years, the king of Thailand's oldest daughter would host a musical show on the Chaopraya river in Bangkok. The shows were usually big events based on Thai legends, or history. 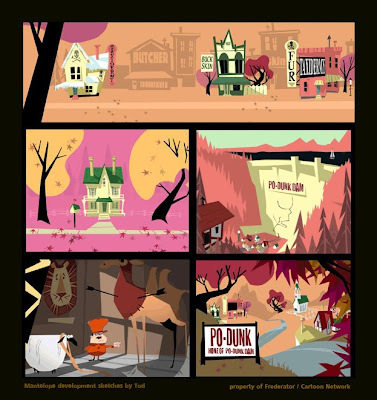 Above: Some of the promo material for the commercial... showing the process of design, rough boards, and a final film still. 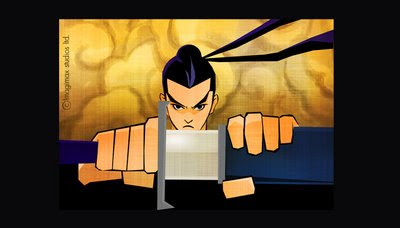 The TV commercial was a mix of live-action, and 3D animation. It was a challenge, because at the time I had little experience with either medium. I was asked to direct the ads for a later production. But unfortunately the show was cancelled because of the tsunami. 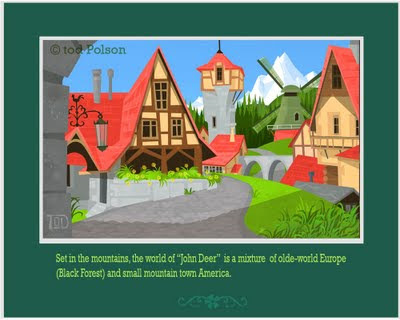 The World of "John Deer"
Above: Caught somewhere between the worlds of humans and animals... John Deer must learn to fit into his new world, dealing with cultural misunderstandings, and the call of nature, while avoiding being eaten. I've been developing a number of T.V. show ideas of my own over the last few years. 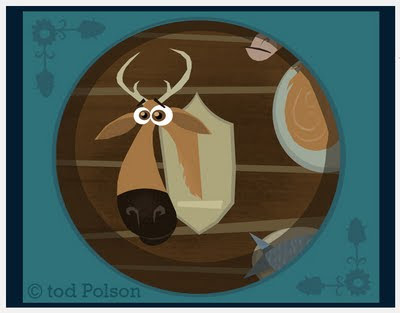 One of those deer to my heart is an idea based on my experiences growing up in a small mountain town in Wyoming. I call the project "John Deer". Above: My town doesn't look like this EXACTLY... but it WAS settled primarily by Danish, Swedish, and English immigrants. After working in Denmark I realized that a lot of what I took for granted as "American" or "Wyoming" building styles were in fact Scandinavian. Of course I have made a few minor embellishments here. Above: Like my own home town, the community of Killdeer is rich in folklore, and characters from folklore: Big Foot, Jackelope, the monster in the lake. But to John Deer... these aren't mere mythological creatures, they are friends. Drawing on the richness of my real, (and imagined) Wyoming roots. Spinning yarns, and telling tall tales has long been a tradition in my town. I plan to incorporate this style of storytelling into the world of John Deer. 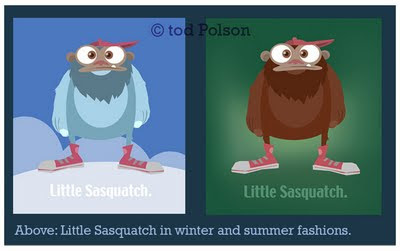 I've written quite a number of stories around these characters. 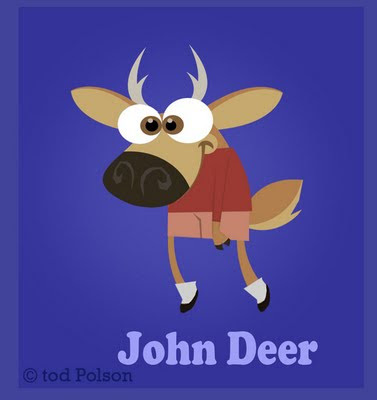 I am still looking for a production partner, but am hoping to make a "John Deer" pilot episode in the near future. Above: Uncle Bob quote: "The closer you are to danger, the closer you are to danger." 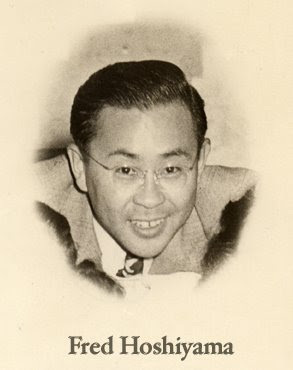 Above: Fred Hoshiyama, in younger years. Sometimes you have a pet project that you never feel quite ready for the challenge. I have been working on "Topaz Diary" with my friend, composer Bill Benson, since college. The story is about another friend of mine, Fred Hoshiyama, and how his life was completely changed in the "Japanese-American Internment" camps of WWII. The story shows how by simple faith, and a lot of love... a bad situation can be turned into good. The score will drive most of the film, Bill and I met recently to discuss plans for the project, he has some wonderful musical ideas and I am working out some visual ideas. Below: Early inspirational sketches for the story from a few years back. To learn more about the internment camps, please visit HERE. Al Tudi Tuhak from Tod Polson on Vimeo. A clip from my student film, made under the guidance of my mentors Jules Engel (UPA, Cal-Arts), and Maurice Noble (Warner Bros). With narration by Maurice Noble, and music by Bill Benson. 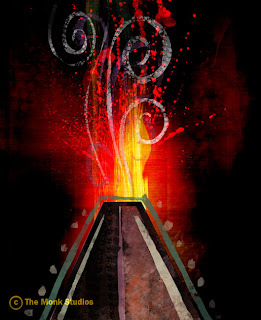 Additional animation by Mike Polvani, and Ben Jones. This year marks sort of an anniversary for "Al Tudi Tuhak" so I thought I would put a bit of it up. When I first moved to Los Angeles I saw a show of masks from the Northwest coast of the U.S. The power and simplicity of the design inspired me to create a short film using Northwest coast story and design as a theme. Several of the Northern stories I researched mentioned the "creator"... or "father of Raven"... but I found no stories specifically "the creator" himself. So, I wrote a story trying to capture the depth and feel of a story from long ago. Above: Development art presented to the board at Cal-Arts in order to get "Al Tudi Tuhak" approved as my thesis. My pal, musician Bill Benson and I traveled to Seattle for research. There we were honored to meet with Upper Skagit tribal elder/ storyteller Taqʷšəblu (Vi Hilbert). 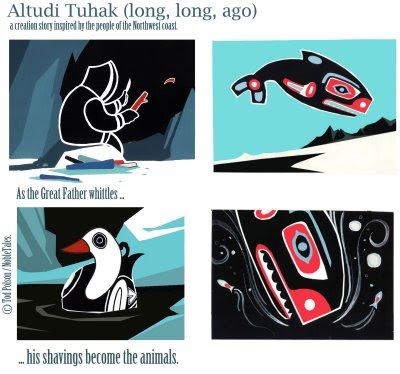 She really liked the story, and named the film "Al Tudi Tuhak"... which in the Lushootseed language means "... long, long, ago." I am not native American, and I had gradually began to feel more and more uncomfortable using native motifs. Taqʷšəblu encouraged me to make the film the way I felt it should be made. "We are storytellers, the stories find us... we don't find them. If you honor the spirit of our people, and yourself, you have done nothing wrong... the story must be told"
I shot the film on 35mm... using house paint, and cut-out paper... using a very simple style. Unfortunately at the moment I have no clean digital copies. Someday I hope to re-transfer the film using modern technology. "Al Tudi Tuhak" toured the festival circuit for a few years, winning the student "Oscar", and receiving an "Annie" nomination. 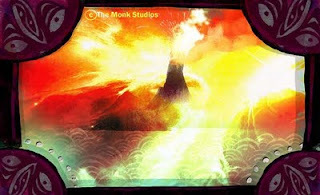 Mantelope from Tod Polson on Vimeo. 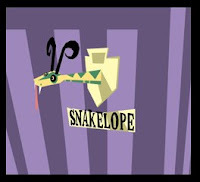 Above: The "Pilot" episode for "Mantelope". A long time ago when my pal, Dave Thomas, and I were working together in San Francisco... the studio we were at "requested" that we come up with a new fantastic t.v. show idea. We were too busy with our other projects to focus on something new. So as a joke, drawing on our Wyoming heritage... we pitched the dumbest thing we could think of "Mantelope": Half man, half antelope! 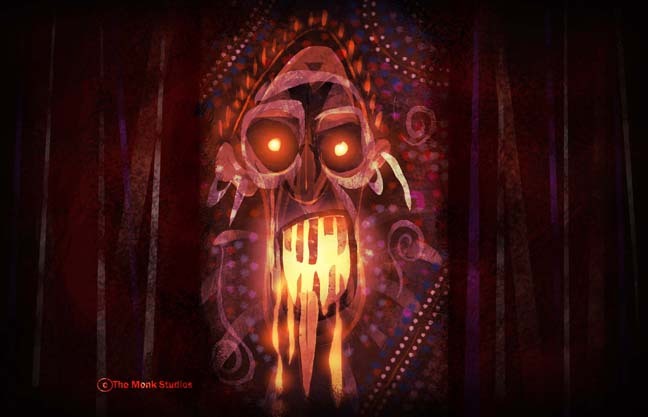 ... hunted by "Hunter Jack" who's only mission in life was to cause the "Mantelope" serious harm... and yes, even death! 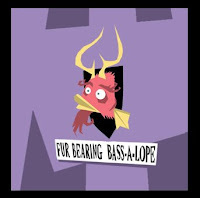 We pitched the show knowing the studio... and Cartoon Network would never go for it. But to our amazement... everyone involved liked the idea! ... and this is the "Pilot episode" we put together. There was interest in developing the idea as a series... Dave and I developed a number of fun, quirky story plots... then the whole thing got hung up in legal limbo. So for better or worse... this is the end of the story of the "Mantelope". 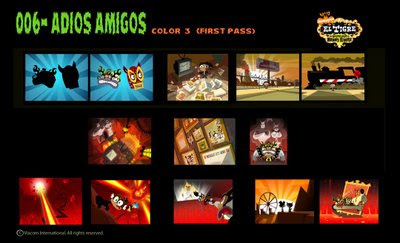 Above: Color keys that would later be reworked in flash. One of my main tasks was developing the look, and getting the short to be less that 1MB ... so I kept things really graphic and simple... re-using as many elements as possible wherever I could... trees... leaves... etc. 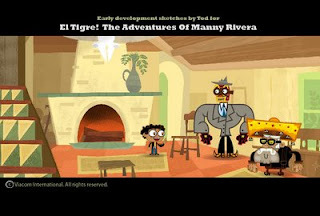 Mantelope was our first flash project... Dave, and I would later join Jorge, and Sandra on their flash show "EL TIGRE: The adventures of Manny Rivera". 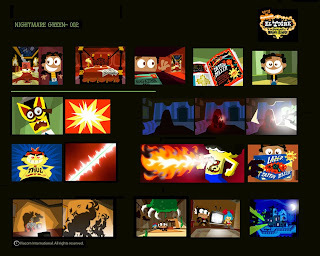 -A while back, my good friends, Jorge Gutierrez, and Sandra Equihua asked me to help them develop the look and color styling of their new t.v. show idea, "El Tigre". 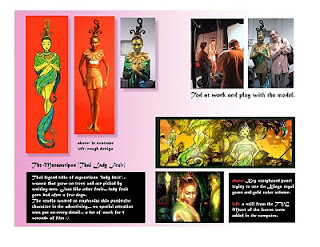 Working under the guidance of Jorge, and art director, Roman Laney. 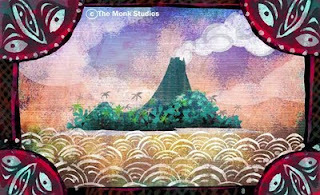 I started with rough sketches of the various locations that would be used in the pilot episode. 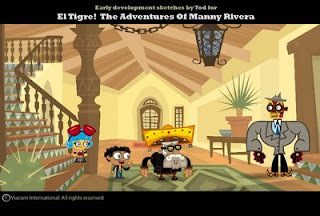 Above: A few early exploratory sketches from "El Tigre!" Most of my early sketches were close in value, with little or no black in the backgrounds. There was a lot of black on the characters, and I wanted them to read well. But this gave a sort of calm feeling, and Jorge wanted everything in the show to be "Super Macho!"... having more contrast, more texture, more of everything. It made designing a bit more difficult, but also gave the intensity Jorge wanted. 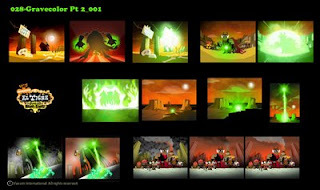 A lot of the art styling was worked out in the pilot by Roman. By the time "El Tigre" had been picked up as a series... the look had been fully established. 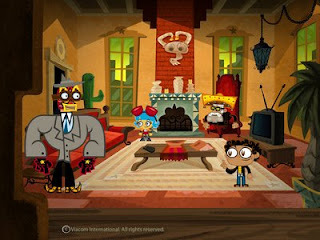 Above: Art director, Roman Laney, and his team took a lot of the development art, and created a beautiful, and unique look for "El Tigre". Check out Roman's website to see more amazing art from the show. Above: A visual structure chart for one of the episodes. I was working overseas, away from the rest of the team, so it was essential that I knew what Jorge, Roman, and Director Dave Thomas wanted for each episode. We were under such tight deadlines that there really wasn't much wiggle room for exploration. You will notice, that all the art follows the story Arc in the visual structure. 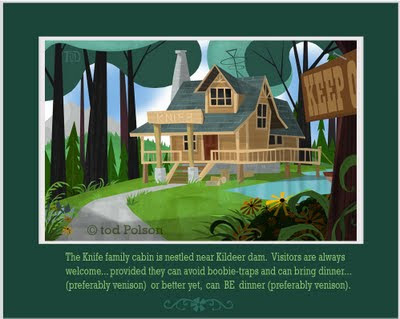 We set up themes early in the show... and then generally kept them throughout all the episodes. For example, high contrast for exciting segments, low contrast for duller moments. We also used color themes throughout the show. 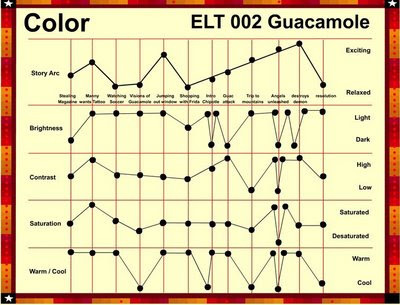 Evil was often symbolized by using black and red, (or the main color of the villian) and El Tigre with green.With so many episodes going on at the same time... it was important that everyone was on the same page. 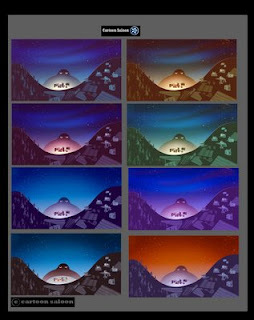 Above: A small sampling of my color scripts from the show. My pal, Dave Thomas' storyboards were the blueprint for everything I did. Dave is a real master of timing, and staging. He and Jorge had worked everything out to make the rest of the teams work as easy as possible. I would usually do a first pass on the color script based on Dave's beat boards, and sometimes keys from Roman. Then Roman, Jorge and I would talk about it... after which I would make my adjustments. 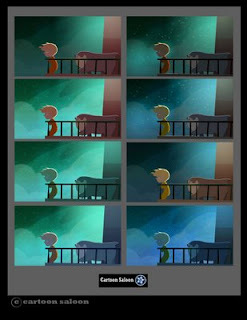 From the color scripts, the rest of the team would have a feel for lighting, mood, color. A fan video... cut together from various episodes. As in most of the projects I am involved with, "El Tigre" was a collaboration of friends, who also happen to be some of the most talented people I know. I was saddened when I learned that "El Tigre" had been canceled. Not only is it one of the best projects I have ever worked on... it is one of my favorite shows to watch.